The Lewisville Science Fiction Book Group will meet on Friday the 13th at 7:30 pm. Join us at the IHOP in Lewisville which is behind the Discount Tire on the northeast corner of I-35 and Round Grove Road. The address is 2345 South Stemmons Freeway, Lewisville, TX. 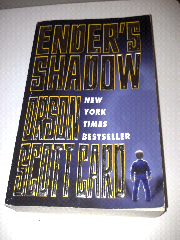 This month’s book will be “Ender’s Shadow” by Orson Scott Card. Even if you read the book years ago, only read part of it, or haven't read the book and just want to see what the book is about, come see us. Once we're done talking about the book, we usually move on to movies, other books, technology, or who knows what. To be honest, I got started and couldn’t finish due to other projects, but I’ll be there with a wiki cheat sheet and a promise to finish it later. I’m hoping they’ll pick a Little Golden Book sci-fi next. I might be able to finish that in time!